This two story concrete block building is located between US Highway 1 and Old Moultrie Road about 1/4 mile south of State Road 312, close to Flagler Hospital, and easily accessible from anywhere in Saint Augustine. The building is served by an extra large elevator and two stairwells. The build-out (see attached floor plans) is medical office with a total of 13 restrooms plus most exam rooms have medical grade sinks/faucets. The building has 6 electric meters and is currently subdivided into 5 distinct medical suites with potential for more. The largest ground floor suite (102) has a large reception/waiting room, six exam rooms (4 with sinks) including a lead-lined x-ray room, laboratory room with pass-thru to the adjacent restroom for samples, one patient restroom plus two staffrestrooms, separate A/C systems, secretarial/bookkeeping area and storage/shelving areas. The largest second floor suite (202) was previously a physical therapy practice with mirrored walls, two restrooms plus reception area/waiting room, filing rooms, 3 windowed private offices, separate A/C system, new water heater, hookup for washer/dryer and lots of storage space. The flooring in most of the building is large format ceramic tile (20" x 20") or wood-look vinyl plank plus some carpeting (Suite 208). 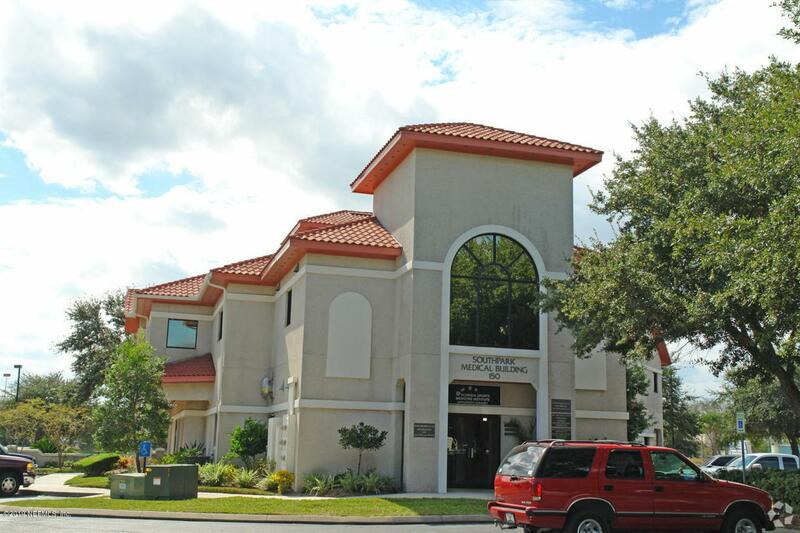 This building is part of the Southpark Medical Association which includes 17 lots. The association maintains the parking lot and landscaping which includes off-site master storm water retention and sprinkler system. Parking ratio 5/1000 sq ft. Listing courtesy of Jax Realty Llc.